When you’re writing a job post, it’s hard to know what works. One job post might yield a flood of applicants while a similar one only gets a trickle. While there are plenty of tips, templates and best practices out there, writing job posts often feels like more of an art than a science. Well, today we’re adding a little more science to the picture with data-driven insights based on 4.5 million job posts on LinkedIn. We analyzed how hundreds of millions of candidates across the U.S. and U.K. viewed and applied to those job posts—and distilled our findings into four simple data-backed tactics and takeaways. Less is more. Shorter job posts (1-300 words) had significantly higher-than-average apply rates per view (the number of applications the job post got divided by the number of views). Keeping things concise helps candidates immediately get the info they need to apply—and since more than 50% of job views on LinkedIn are on mobile devices, shorter descriptions are literally a better fit for modern candidates. 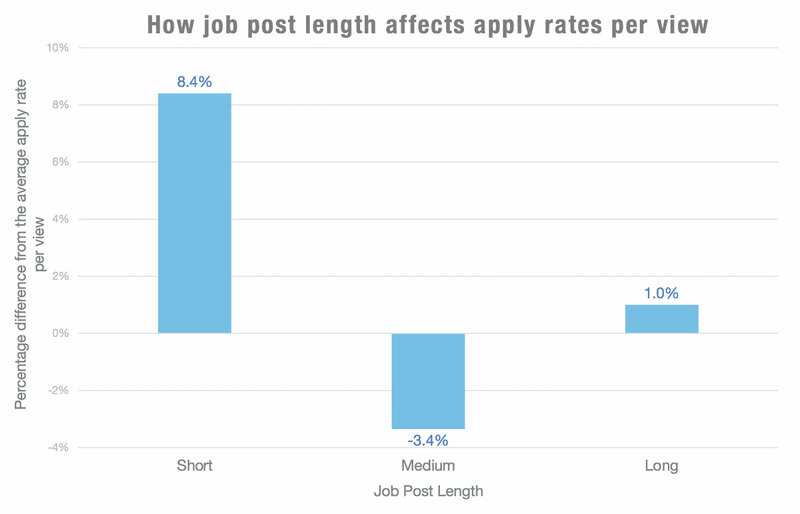 These short posts got candidates to apply 8.4% more than average, while medium job posts (301-600 words) performed 3.4% below average and long job posts (601+ words) did only 1% better than average. Men applied to jobs they viewed 13% more frequently than women. In other words, women were less likely to apply to any given job post they saw—which means there may be more female talent out there than your applicant pool might suggest. A recent study found that job descriptions with “masculine” words made women less interested in the job—even though it didn’t make them feel less qualified. You can encourage more women to apply by avoiding these terms: see the 2018 Ultimate Recruiting Toolbox for a handy list of biased words to stay away from and gender-neutral terms to replace them. You can also run your job descriptions through this app for free to test them for gender-coded language. Candidates view and apply to job posts most often on Mondays—and well over half of all job views (59%) and applications (57%) take place over the first three days of the work week: Monday, Tuesday, or Wednesday. So, if you’ve got your job post all queued up at 5pm on Friday, don’t expect a tidal wave of applications right away—you’re likely to get far more candidates at the start of the work week. Candidates jump at the chance to apply to jobs in some industries, while others have a tougher time converting job post viewers into applicants. The tech (software) and telecom industries come in second and third, respectively, with apply rates 8.3% and 7.6% greater than average. The government/education/nonprofit industry isn’t so lucky. Whether it’s the job posts or the jobs themselves that aren’t attracting candidates, the industry had the lowest apply rate by a wide margin—nearly 23% lower than average. If you’re recruiting in one of these industries, don’t despair. If it seems to be taking a bit longer than usual to find the right candidate—these benchmarks reveal that the rest of the industry is right there with you. The data points above can be both prescriptive and descriptive: they can tell you what to do differently and provide benchmarks to see where you stack up. You can shorten your job posts if you’d like to get more applicants, and you can use the benchmarks to measure yourself and manage expectations. For example, you’ll know you’ll need patience if you’re recruiting for a government job on a Saturday night—or that you can expect a deluge of applicants if you’re looking to fill a staffing role on a Monday morning. Whether you’re using the insights to attract more candidates or set expectations, remember that these are guidelines, not rules. For best results, combine these tips with qualitative insights (like our job post heatmap) and tailor them to your own talent strategy. Even as talent intelligence becomes an essential tool in every recruiter’s toolkit, you still need human expertise to unlock the full potential of these insights. Data will continue to become a central part of talent acquisition, but it’ll never replace the human element brought by skilled recruiters. We analyzed about 4.5 million jobs posted between 2016–2017 in the United States and the United Kingdom. Gender was inferred by member name. Insights #1 and #4 are based on comparisons of apply rates per view, what is the percentage of jobs posts that candidates apply to out of all those they view. The industries cited in insight #3 are based on the industry field in a job post; by default, this is the industry of the job poster, but can be changed if the job is for another industry (e.g., in the case of a staffing professional posting a job on behalf of a client).